New features of the website allow users to find the warehouse shelving or supply product they need quickly and efficiently. Action Wholesale Products, a key player in the industrial shelving industry, has launched a new website focused on customer service. Customers can now access this website on their smartphones or tablets, as well as desktop computers to purchase inexpensive, yet high quality industrial shelving. Action Wholesale Products' new website features an easy to use search bar which allows users to either browse available shelving categories or search for a specific product. Another change with Action Wholesale Products' new website is that it is now accessible on mobile devices and tablets. This will allow customers such as busy warehouse managers, to search for new products while on the go from whichever device they’re comfortable using. "We are excited to launch this new, improved website for our thousands of customers. New features have been designed with the user in mind so that they can make their purchase with ease and confidence," says Toby Baran, General Manager. Action Wholesale Products' commitment to providing top rate customer service at the lowest prices is evident in the improvements on the new website and their 37 years of continued service. The website showcases Action Wholesale Products’ vast inventory of warehouse supplies such as a array of commercial shelving, industrial workbenches, storage bins, ladders, carts, and much more. 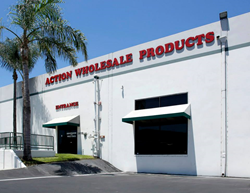 Action Wholesale Products, an industrial shelving and warehouse supply leader, has been in business for over 37 years in southern California. Specializing in commercial shelving, their Anaheim warehouse houses a huge inventory of in-stock industrial supplies, making shipping and delivery quick and reliable. Action Wholesale Products also has a low price guarantee on all of their products, which are advertised as being marked down 40-60% from manufacturer pricing. For more information on Action Wholesale Products please visit their website at Actionwp.com.